Crazy weather…snow is on the way and where I am, we could have 4 to 6 inches of the white stuff. I can’t remember a time when we have had any snow before Halloween. Here is to hoping the weather people are actually wrong about this, like they usually are. Yesterday I had a package on my doorstep, it was the 2nd installment of my birthday gift, the Beer Of The Month Club. Yesterdays beer was part of that so I will continue with the gift. Beer #334 is Saranac Vanilla Stout by Matt Brewing Company from Utica, New York. Interesting to note is Matt Brewing Company is the 2nd oldest family owned brewery in the US, brewing beers since 1853. Tonight’s beer, an American Stout, has an ABV of 4.8%. Appearance – Black as night with just a ring of a light brown head. Nose – Smelled like cream soda with a hint of coffee. Taste – Some roasted malt flavors of chocolate and coffee being just a tad bit sweet. The vanilla added to this reminded me of cream soda…in a way…mostly towards the back end of this and into the aftertaste. Mouthfeel – The body was south of medium and north of light. There was more of a carbonation sting that I was expecting. Low alcohol content make these go down awfully easy. Overall – This wasn’t all that bad…just nothing here made me say “wow”. I wish it was a little more heavier in the body and a bit smoother. I have two more of these from the Beer Of The Month Club (I get 4 different beers and 3 of each) that just may be good for tonight’s Battlefield 3 playing session…not that I support drinking while gaming…but it does seem to make me play better. Bigfoot has always fascinated me. That fascination goes back to when I was a kid and saw the famous Patterson-Gimlin footage shot at Bluff Creek, California. Was it a fake? I don’t know but I do know it left a lasting impression on me. So much so that every once in a while I find myself hunting for Sasquatch (love that word) but imagine my surprise when I found the big footed fellow not in the deep woods of New Jersey, but in the big aisles of my local Joe Canal’s…not that I actually found Bigfoot but a beer named after him. That beer, #222, is Lilja’s Sasquatch Stout by Pangaea Beer Company. Pangaea Beer Company hails from Wisconsin and they brew this American Stout with an ABV of 7%. Just a word of caution to all the New York Yankee and Derek Jeter haters, from now until Mr. Jeter gets his 3000th hit, of which he is 2 away, I will be using my Yankees glass. 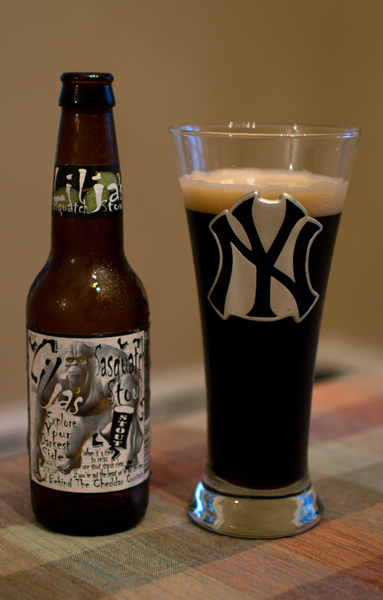 So into that said Yankee went this black brew. The head of this was light brown and dense. Lots of cool lacing was left on the glass from that head. I took smell, it had a nice roasted malty aroma with dark chocolate and a faint sweet thing going on. The dark chocolate flavors hit me first in the taste followed by a sweet almost fruity flavor, what fruit though was beyond me. It finishes with just a slight coffee flavor that disappears very quickly. It had low carbonation, was quite smooth and had a body midway between light and medium. I was a bit disappointed as I was expecting something a bit more sticky and full bodied. Overall a decent beer and a fine way to end the week. My weight this morning was 159 lbs…only one pound over my starting weight. I have had beers from 18 different countries not including the USA. I have had a beer from 26 different US States. California leading the way with 21 beers. The average rating (A+=5, A=4, B+=3.5, B=3, C=2, D=1, F=0) over those 182 beers is 2.94…slightly less than a B.
I have spent $812.64 with an average price of $4.51 a beer. The high was $13.49 (twice) and the low was $1.27. I have had 12,108 views of this blog. A huge thanks goes out to all who view this blog and put up with my writing style. Most of all I have had a great time trying all of those beers I probably would have never tried. Cheers to me and on with the 2nd half of this 365. I think I’m going to switch things up with a new format in how I write this blog. There will be some general banter followed by six categories (Stats, Appearance, Nose, Taste, Mouthfeel, Overall) in which I describe the beer making it easier for me to blog this every night. I love change and hope you all do to! Thanks again for viewing this and now on to the beer. 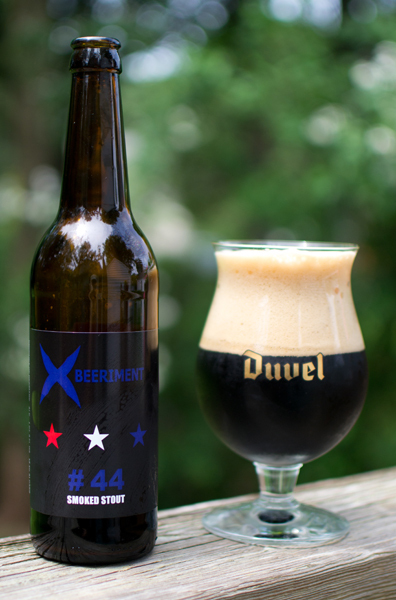 Beer #182 is Xbeeriment #44 Smoked Stout by Xbeeriment I/S. I was disappointed with this as my halfway point beer. For the price, I was expecting much more and to be honest, to be blown away. I wasn’t. To me , this was an average American Stout. Not really worth the asking price. Oh well…off to the 2nd half. Cheers! Today was a nice lazy Sunday. I spent it reading a book about an eagle…and enjoying my daily brew. The title of the book is An Eagle Named Freedom. It is a good story about a man whose life is changed by a rescued eagle. If you are into reading and enjoy feel good stories…give it a go. 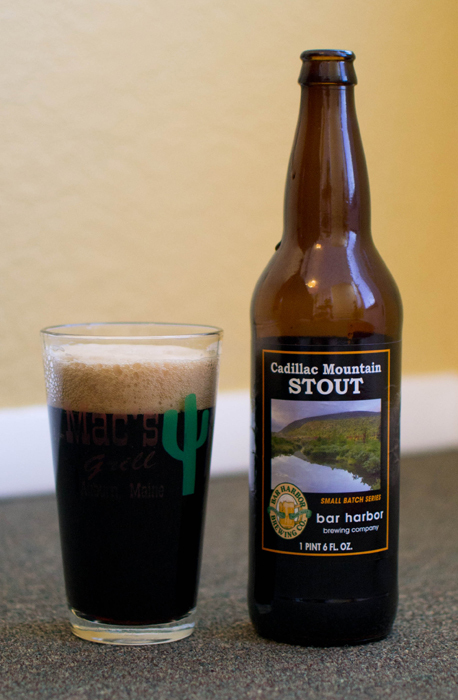 Beer #119 is Cadillac Mountain Stout by Bar Harbor Brewing Company. From Maine comes this American Stout. This beer has an ABV of 6.7%. Of note, the mountain this beer is named after, Cadillac Mountain (Acadia National Park), is the highest point within 25 miles of the east coast of the United States. It towers to a lofty 1528 ft. OK, maybe not so lofty compared to the mountains out west but pretty impressive nevertheless for being on the coast. I suggest if you have never been there, and are in the great state of Maine, take a detour to Acadia National Park and hike to the top of Cadillac Mountain. Unless you are a sissy, then you can drive a car to the top. Either way, the views are magnificent. I pulled out a pint glass I haven’t used in quite some time…a glass from Macs Grill in Auburn, Maine. I figured it would be a good glass to pour todays beer into being both are from the state of Maine. Cadillac Mountain Stout poured a lovely black with a nice tan head that left some awesome lacing. The nose was really nice, it consisted of dark roasted malts and dark chocolate. The taste really nice too, roasted flavors up front followed by those nice chocolate flavors. There was a nice coffee/chocolate aftertaste that I absolutely love. It had a nice medium body, was quite creamy, and was low on carbonation. This was very drinkable but I took my sweet old time with this enjoying every last drop. Another Kingly brew and a fine stout indeed. Another day, another stout. Not that there is anything wrong with that. Stouts are one of the most, at least from the people I know, misinterpreted beers around. Thick, heavy, motor oil-like, etc. are some of the common words used to describe them but that is, at least in my experience, very far from the truth. Tonights beer, beer #92, is an American Stout. What separates an American Stout from the Irish or English version you ask? It is an American Stout because it is brewed in America you silly sausage. To be honest, I’m not quite sure what separates them but from a little research (Google search) it seems they use American Hops and Malts, add coffee or chocolate to the brewing process and have a hoppier, higher alcohol content. I’m no expert, so take that for what it is worth but that sounds good to me. This stout had an ABV of 5.2% and is brewed by Old Dominion Brewing Company from Delaware. A nice dark brown, almost black liquid was staring back at me as I pondered what exactly an American Stout is. The typical tan head, two fingers in width, graced this but got smaller by the minute. I let it warm up to room temperature as I find most beers tend to really open up taste wise and nose wise if they are not super ice cold. There were some nice aromas of chocolate and vanilla which both carried over to the taste. The vanilla was a bit stronger in the taste but not overpowering. I was reminded of cream soda in the taste and the smell. It finished off sort of like coffee after it gets cold. It was a bit more carbonated than I was expecting and had an overall medium body to it. It wasn’t the smoothest stout I have ever had but still was an easy drinking beer for me. I thought this was a pretty nice stout, certainly better than what I had yesterday. I wouldn’t turn this down if offered another. Give it a try if stouts are your thing. Just don’t believe in all the misconceptions about them as they are more than likely not correct.